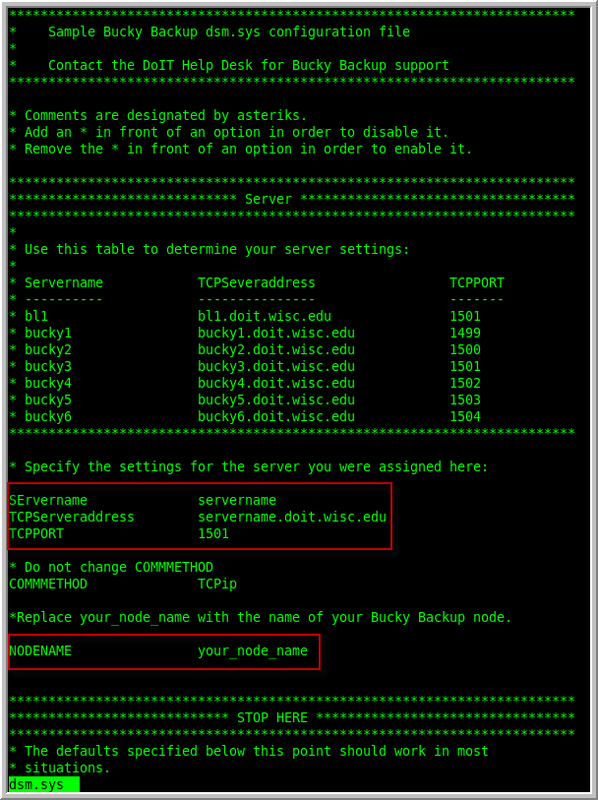 This document explains how to download, install and configure the Bucky Backup client for a Linux server/computer. Confirm that your computer/server meets the Bucky Backup client environment prerequisites. Check the list of known problems and limitations for the Bucky Backup client. 32-bit TSM client for Linux (6.2.5.4) - This version no longer supported by IBM, but is the most recent version available for 32-bit Linux installs (which may still be supported by their vendors). Some additional software may be required (such as JRE for client GUI). Extract the client installation files into a temporary directory. If you have a previous major version you should remove it first with the rpm -e option. A major version change would be moving from 6.2.x.x to 6.3.x.x or 5.5.x.x to 6.x.x.x. A minor version update (6.3.0.0 to 6.3.1.0) will require the "-U" flag rather than "-i" for rpm. Change into the temporary directory and install the new Bucky Backup client. If you have a previous major version you should remove it first. A major version change would be moving from 6.2.x.x to 6.3.x.x or 5.5.x.x to 6.x.x.x. A minor version change may only require an upgrade (6.3.0.0 to 6.3.1.0). Before the Bucky Backup client can be used communication, logging, processing, and scheduling options must be configured for the server. Replace the sample dsm.sys.smp client option file in the /opt/tivoli/tsm/client/ba/bin/ directory with this dsm.sys file that has been customized for the Bucky Backup environment. Replace the sample dsm.opt.smp client option file in the /opt/tivoli/tsm/client/ba/bin/ directory with this dsm.opt file that has been customized for the Bucky Backup environment. Replace the sample incldexcl client option file in the /opt/tivoli/tsm/client/ba/bin/ directory with this inclexcl file that has been customized for the Bucky Backup environment. See IBM's creating and modifying the client system options file documentation for an overview of the configuration process. Check the Bucky Backup registration response email to find out which Bucky Backup server your node connects to. Configure the Servername, Nodename, TCPPort and TCPServeraddress entries in the dsm.sys file for your node. Next, configure the servername option in the dsm.opt file. See IBM's communication options documentation for more details. Review IBM's configuring the client scheduler documentation. Select either the traditional client or the client acceptor daemon (CAD)-managed scheduler method.CAD recommended for Linux distributions that use systemd. Configure the schedmode option for polling in the dsm.sys file. Configure the queryschedperiod option in the dsm.sys file. Configure the dsmc scheduler to startup automatically at system boot. Configure the managedservices option for schedule in the dsm.sys file. Configure the dsmcad daemon to startup automatically at system boot. Note: The default options set in the sample files above, dsm.sys, dsm.opt, and inclexcl, should work for most users. Configure the resourceutilization option in the dsm.sys file to define how many concurrent sessions the Bucky Backup server and client can use during processing. 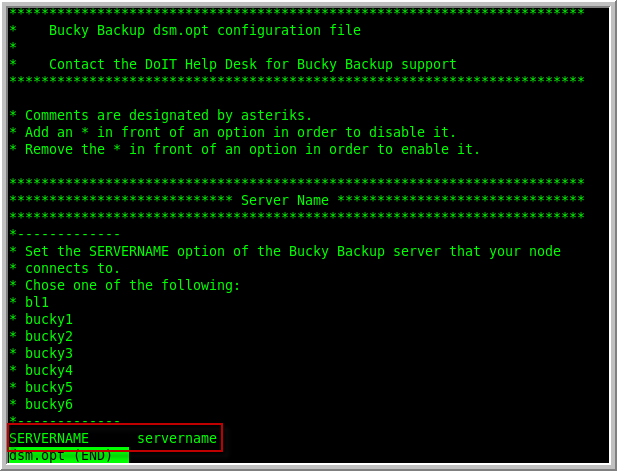 Configure the users option in the dsm.sys file to specify which users are authorized to request Bucky Backup services. Configure the passwordaccess option in the dsm.sys file to determine if you want to save the Bucky Backup node password or be prompted for it at the start of each backup session. Configure the errorlogname and errorlogretention options in the dsm.sys file to specify the name of the error log and how many days to maintain the error log before pruning it. Configure the schedlogname and schedlogretention options in the dsm.sys file to specify the name of the scheduler log and how many days to maintain the scheduler log before pruning it.